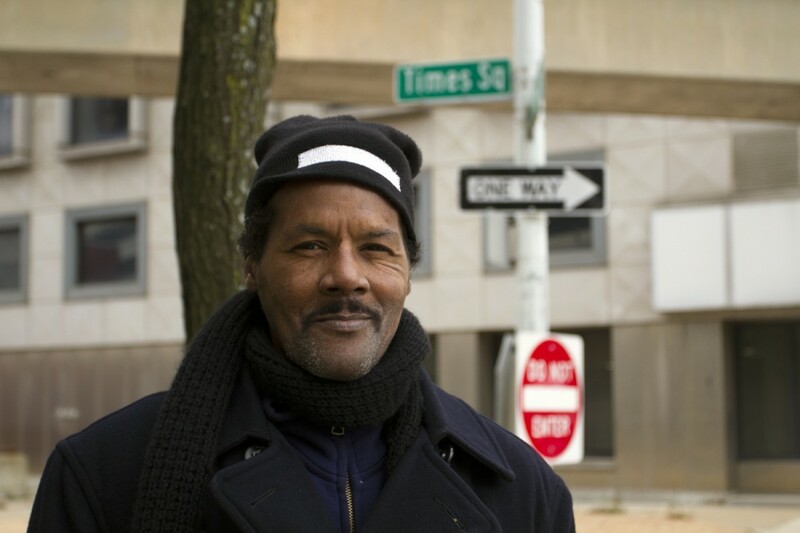 Barney Johnson, 60, in downtown Detroit on Thanksgiving Day. The 60-year-old was waiting for a bus at Times Square in downtown Detroit on Thursday afternoon when a shiny sedan pulled up. The smiling driver held out a thick paper plate covered with foil. “Really?” Barney said, looking at the driver with wide eyes. Barney peeled back the foil to find warm turkey, mashed potatoes, macaroni and cheese, collard greens and an oatmeal cookie. 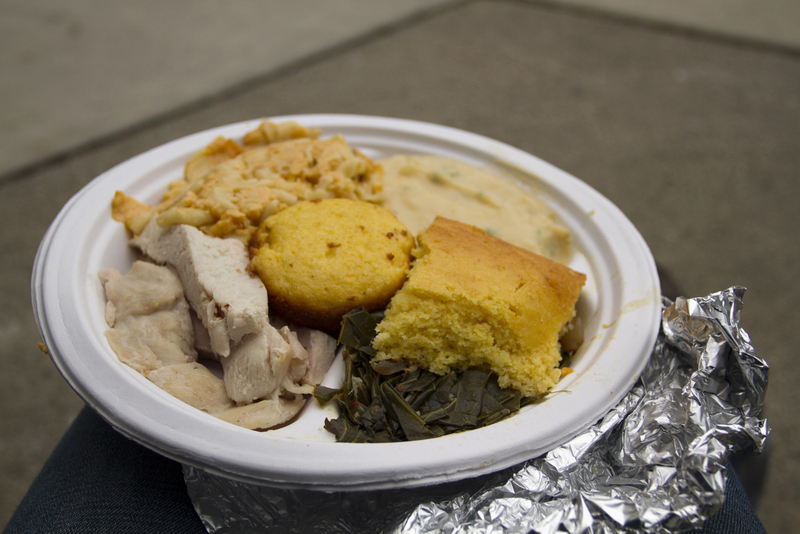 The driver, a well-dressed man with piles of meals to hand out, insisted I take a plate too. How could I not? A delicious meal cooked by a stranger. So Barney and I sat down on a cold curb and ate our meals with plastic forks. We talked for an hour about Detroit, bad luck and family. I asked him if he liked the city. Barney asked me about my family and wanted to know why I was eating a Thanksgiving meal from a paper plate and not with my loved ones. We talked like old friends, almost forgetting we were shivering strangers outside of a bus stop. Barney boasted about the 1970s, when he said the city was still brimming with people and hope. The memories made him smile, but he rarely talked about what he’s up to now. His skin is cracked from the cold, and voice is gravelly. 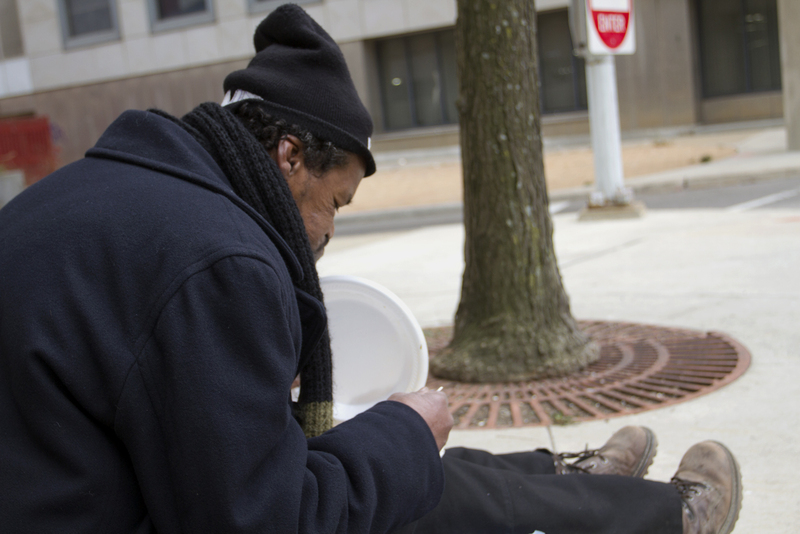 Barney and I sat on a cold curb and ate a delicious Thanksgiving meal on paper plates. When we finished our plates, Barney stood up from the curb and extended his hand. I shook it firmly, and then we hugged. It was a big, warm embrace. “Thanks for this,” he told me. “Thank you,” I told him, my eyes unexpectedly welling up with tears. As I was about to leave, Barney sprinted across the street and returned with a pen and piece of paper. He wrote down his mom’s address and phone number. “It’s a plan,” I responded earnestly, pedaling my bike back home with a full stomach. After finishing up some work, I thought again about Barney and the bond we shared over a Thanksgiving meal. It all happened because of the random kindness of a stranger. I am grateful for both of them. Awesome… I love stories like this. People need to realize Detroit has good people like Barney and it’s an honor and pleasure to uncover them. Strangers no more. Brotherhood in the real sense of the word. Great real life story Steve. A random act of kindness. A great thanksgiving gift. Btw, in this hour you spent together, did a bus manage to show up? Good question. I bus did eventually show up. When the student is ready, a plate will arrive. What Barney Johnson said is simple on the surface but profoundly deep below. The danger he refers to renders most of the city unfit for habitation, and the conditions cause decent residents of Third World Detroit to suffer a loss of freedom, if not life. The colonials, and their elected and appointed puppets, know and care not what they do.